Clean air exhaust filter stacks are being moved through a lay down area. Photo: Program Executive Office, Assembled Chemical Weapons Alternatives. 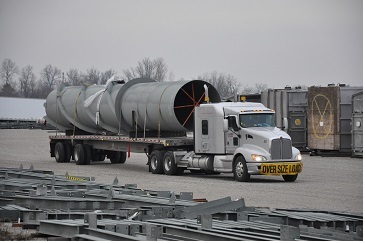 Kentucky Division of Waste Management’s Blue Grass Army Depot section provides information on the Bluegrass Army Depot demilitarization effort through the Demil Dispatch newsletter. The most recent issue is now available for download here.